In Chapter 8,"Formulas and Logic," we looked at the differences between Basic Syntax and Crystal Syntax and created formulas using both. This appendix has been put together as a handy, in-depth reference of the differences between the two and provides listings of the functions and operators in each syntax. This list is by no means exhaustive, but it hopefully provides you with some idea of the main and most-used syntax in cases where Basic and Crystal Syntax differ. To change between Crystal and Basic Syntax within your report, create or edit an existing formula, and use the drop-down list shown in the in the upper right corner of Figure C-1 to select the syntax you want to use. Remember that you cannot combine both syntaxes in a single formula and that it is possible to use Crystal Syntax only in a record selection formula. By default, when you open the Formula Editor, the syntax will default to Crystal Syntax, but you can change the default settings through options found in the Report Designer itself. To change these settings, open a report and right-click anywhere within a blank area of your report. 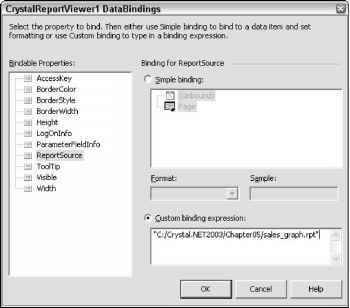 From the right-click menu, select Designer ^ Default Settings and then click the Reporting property page to open the dialog shown in Figure C-2. You can use the drop-down list provided to change the default syntax that will be selected when you start the Formula Editor. Remember, you can always change this setting manually within the Formula Editor if you would like to use the other syntax.